This Friday, April 5th, CSB held our annual Undergraduate Poster Session with posters from 42 students. They prepared posters and answered tough questions on the experimental work they undertook in our research laboratories over the year. Their dedication and hard work was abundantly evident in the quality of their posters. Thank you to all the students who devoted their time, their intellect and their dexterity to these informative projects. We also appreciate the guidance of the supervisors and grad students who aided them along the way. As part of the poster competition, students competed for the F Michael Barrett Award. 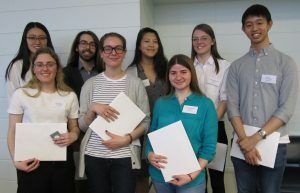 The winners this year were Elina Kadriu (Christendat Lab), Matthew DeLuca (Mitchell Lab), Zana Nastic (Godt Lab), Victoria Shelton (Moses Lab), Clare Breit-McNally (Guttman Lab), Chengyin Li (Saltzman Lab), Anastasia Liu (Currie Lab), Patrick Ly (Christendat Lab) and Aaryn Montgomery Song (Gilbert Lab). The award is named for Michael Barrett, a professor (now retired) who taught over 500 undergraduate students per year and administered some of our larger courses with great care and concern for our students. Over the years, he was involved in course design and curriculum development within the department and across campus. We would like to thank our judges for making the difficult choice between these excellent posters. Our thanks and appreciation go to Undergraduate Office staff Janet Mannone and Genna Zunde for planning the day, organizing the event and ensuring plenty of refreshments and food were available. ← Variational Infinite Heterogeneous Mixture Model for Semi-supervised Clustering of Heart Enhancers.